The San Miguel de Allende graben, Guanajuato, Mexico, contains numerous rhyolitic volcanic ash beds. Electron microprobe and x-ray fluorescence analyses of glass shards from 14 localities, combined with mineralogic, stratigraphic, radiometric, and paleomagnetic data, allow us to correlate the ash beds (and the intervening sedimentary strata and fossils), understand the timing of volcanism, date the age of extension, and better understand the tectonic and volcanic evolution of central Mexico. 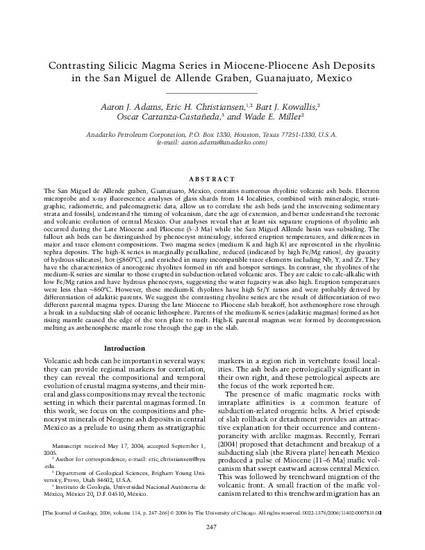 Our analyses reveal that at least six separate eruptions of rhyolitic ash occurred during the Late Miocene and Pliocene (5-3 Ma) while the San Miguel Allende basin was subsiding. The fallout ash beds can be distinguished by phenocryst mineralogy, inferred eruption temperatures, and differences in major and trace element compositions. Two magma series (medium K and high K) are represented in the rhyolitic tephra deposits. The high-K series is marginally peralkaline, reduced (indicated by high Fe/Mg ratios), dry (paucity of hydrous silicates), hot (860_C), and enriched in many incompatible trace elements including Nb, Y, and Zr. They have the characteristics of anorogenic rhyolites formed in rift and hotspot settings. In contrast, the rhyolites of the medium-K series are similar to those erupted in subduction-related volcanic arcs. They are calcic to calc-alkalic with low Fe/Mg ratios and have hydrous phenocrysts, suggesting the water fugacity was also high. Eruption temperatures were less than 860_C. However, these medium-K rhyolites have high Sr/Y ratios and were probably derived by differentiation of adakitic parents. We suggest the contrasting rhyolite series are the result of differentiation of two different parental magma types. During the late Miocene to Pliocene slab breakoff, hot asthenosphere rose through a break in a subducting slab of oceanic lithosphere. Parents of the medium-K series (adakitic magmas) formed as hot rising mantle caused the edge of the torn plate to melt. High-K parental magmas were formed by decompression melting as asthenospheric mantle rose through the gap in the slab. The Journal of Geology 114.2(Mar 26): 247-266.